Five years ago, the list of hepatitis C (HCV) treatment options would have been very short. We now have seven FDA approved direct acting antivirals (DAAs), as well as ribavirin, for treating all HCV genotypes. With so many options, there can be confusion over what treatment to take. There are many treatment options for people with various HCV genotypes (GT), treatment histories, levels of cirrhosis, and other co-morbidities (things like renal disease or HIV/HCV co-infection). 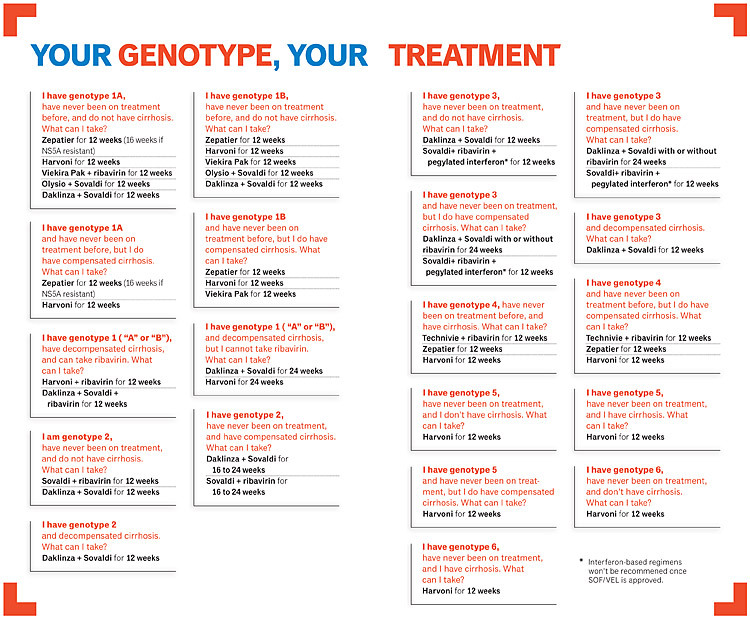 With so many options comes confusion about which regimen is right for which genotype or treatment history and so on. This goes for patients and providers alike! The American Association for the Study of Liver Disease (AASLD) and the Infectious Disease Society of American (IDSA) have produced a guide to help medical providers with expert guidance on screening, managing, and treating HCV. This brief article is designed to provide you with a listing of these recommendations for treating HCV in treatment-naïve patients with and without cirrhosis. All of these treatments are FDA approved, but they also include some “off-label” options (that is, not FDA approved for a particular use but shown to be effective for that condition or population) for people with HCV. As you will see on the next page, treatments are now shorter and more effective now than ever before. The treatments have the added benefit of being better tolerated with fewer side effects. For information on possible side effects, check out the individual drug pages found in this year’s guide. This list of treatment options is not exhaustive: We cover the first-line (first-time treatment) recommendations only. There are alternatives listed in the HCV guidance, and your provider can review those with you should you need them. Of course, any treatment decision will be done with your medical provider. We hope this article provides you with a clear starting point in your journey to a cure from HCV. Everyone living with HIV and most everyone living with HCV should be treated for those infections, according to U.S. guidelines for the two conditions. Fortunately, the same hep C treatment options are available for people co-infected with both viruses. HIV/HCV-co-infected persons should be treated and retreated the same as persons without HIV infection, according to the AASLD/IDSA Guidance. Thus all the regimens listed below can be taken by co-infected people, and the cure rates show similar response rates as they do for people living with HCV alone. Patients living with co-infection may have to adjust their HIV regimen to avoid drug-drug interactions, but no one should ever stop their HIV medications to accommodate their HCV ones. Switching HIV medications can be a very traumatic experience for someone, and if this is an issue for you, the combination of Daklinza plus Sovaldi is an option. Regardless, your HIV and HCV medical provider should be in consultation with one another, and any switch in your HIV medications should be done in collaboration with your HIV care provider. A quick note on the next medication that is likely to receive FDA approval, velpatasvir/sofosbuvir: As this issue was going to press, this medication was not yet FDA approved (it’s due to be reviewed on June 28, 2016). When it is, it will most likely be added as a treatment option for all genotypes. POSITIVELY AWARE will update the online version of this chart once this happens. What about treatment-experienced patients, that is, people who tried treatment before, but it didn’t work? There are many options currently available for treatment-experienced patients (and several more currently in development), but it can be complicated to decide which one is right for you. 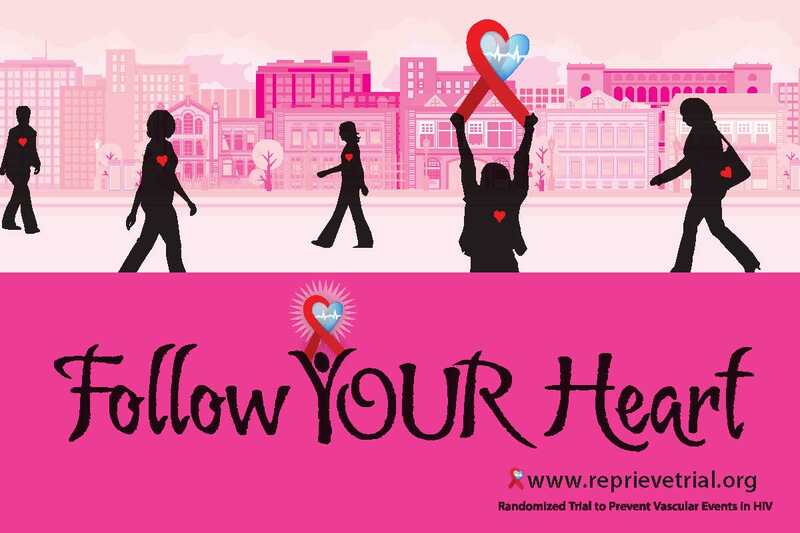 Your provider will need to know your treatment history, possible HCV drug resistance, and your overall liver health before she/he can decide which regimen is right for you. The AASLD/IDSA HCV Guidance does have a long list of recommendations with each of these variables, but due to the complications and space constraints of this guide, they are not listed here. They can, however, be found in the online version of this article, at positivelyaware.com. What about the treatment options for people with other co-morbidities? Regardless of genotype, patients who have decompensated cirrhosis, kidney (renal) disease, or are post-transplant with HCV have treatment options, but they should have enhanced monitoring by a medical practitioner who has expertise in managing that condition, ideally in a liver transplant center. If you fall into one of these patient categories, consult with your provider about the best course of care to take. There are many treatment choices available for people living with HCV. The charts are a snapshot of these choices, but there are many considerations such as side effects, co-morbidities, and other matters that one must consider before making that treatment decision. Gather the help you need to make that decision: Speak with your medical provider, pharmacist, or nurse about these options. Go to a support group and speak with other patients to hear about their experiences. Project Inform and four HCV organizations staff The Support Partnership’s “Help-4-Hep” national HCV phone line. Call us at (877) HELP-4-HEP, or (877) 435-7443, and speak with a trained counselor about your treatment options. See the guidelines at hcvguidelines.org.